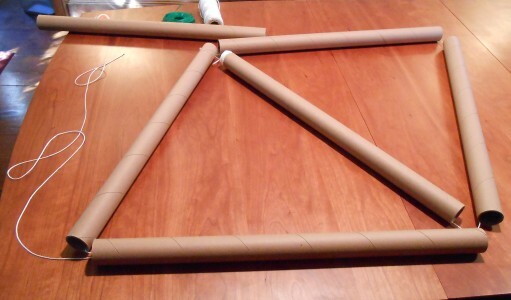 Continuing a Math Mondays tradition of building Sierpinski triangles and tetrahedra out of various materials, today we’re going to do it with mailing tubes. 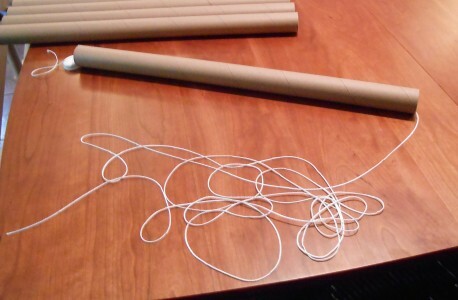 The basic unit requires six identical mailing tubes and a piece of cord or twine about 8.5 times as long as the tubes. In my case, I used two-foot long tubes with a one-and-a-half inch inner diameter and about 19 feet of braided mason’s cord. If the tubes are lettered A, B, C, D, E, and F, each of which has ends 1 and 2, you begin by running the string through tube A in through end 1 and out of end 2. 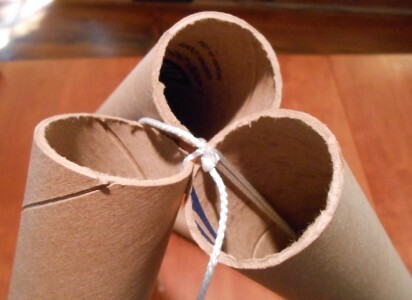 You’ll be working with the string coming out from end 2, so do something to prevent the string from pulling through end 1 — either have a friend hold the string at that end, or tie it to something that won’t go through the tube (like a tube cap with a hole punched in it), or temporarily tape it to end 1. 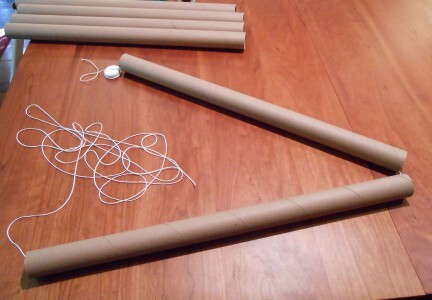 Now take the end of the string coming out from end 2 and string it through tube B, going in end 1 and out end 2. Continue in this fashion through tubes C, D, and E, always going through the tube in end 1 and out end 2. Now take the string, which should be coming out end 2 of tube E, and thread it through tube B again, in end 1 and out end 2. 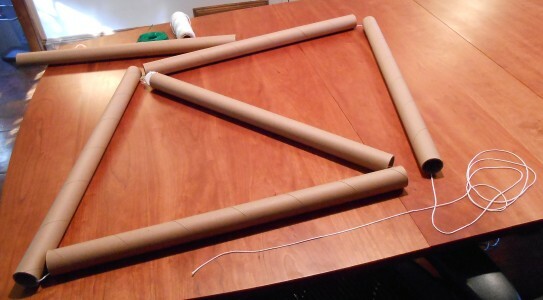 This will close up a rhombus formed of tubes B, C, D, and E.
Now take the free end coming out of tube B end 2 and thread it through the last tube F from end 1 to end 2. Finally, thread the string through tube D again, but in the opposite direction, from end 2 to end 1. This should leave the end of the string you’ve been working with right next to end 1 of tube A, where the other end of the string should be waiting for you (sorry this pic is a little blurred). Pull both ends of the string as tight as possible — there should be no slack at any of the corners — and tie them together, as tightly as you can possibly manage. 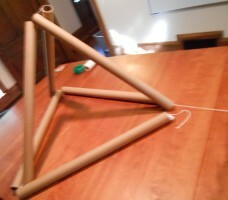 That produces a nice, stable regular tetrahedron. 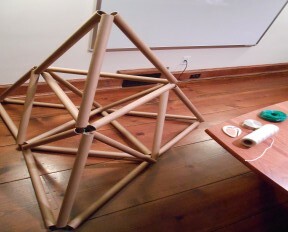 If you like, you can recurse: Make four of these units and join them at corners to make a 4x tetrahedron, or even make four of those and join them, etc. Note in such a case, you probably want to reinforce the horizontal joints by inserting a lightweight pipe or tube into both ends of the horizontal tubes meeting there. In the pictures, you can probably just make out the bright red foam cylinder I’ve used at one joint. 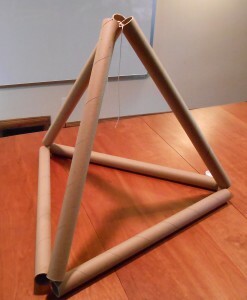 In fact, the tetrahedron pictured here is a prototype for a giant building event to be held at the upcoming World Science Festival Street Fair to be held in and around Washington Square Park on Sunday, June 2. 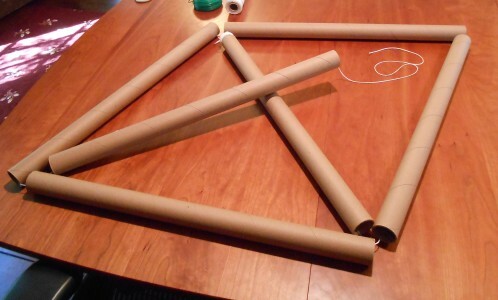 So if you happen to be in New York that day, come on down to the plaza in front of the Courant Institute and help us build a giant tetrahedron!